Clifford Walter Dupont, GCLM, ID was a Rhodesian politician who served in the internationally unrecognised positions of Officer Administrating the Government and President. Born in London and qualifying as a solicitor, Dupont served during the Second World War as an officer of the British Royal Artillery in North Africa before first visiting Southern Rhodesia in 1947. 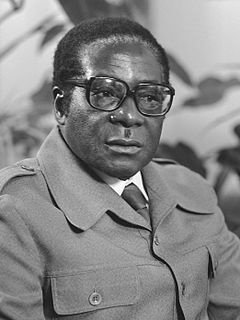 He returned a year later, started a ranch and emigrated full-time during the early 1950s, by which time the country had become a territory of the Federation of Rhodesia and Nyasaland. James Angus Graham, 7th Duke of Montrose ID, styled Earl of Kincardine until 1925 and Marquess of Graham between 1925 and 1954, was a Scottish-born Rhodesian politician, farmer and aristocrat. 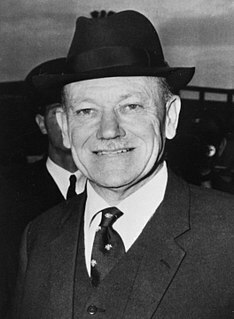 He served as Minister of Agriculture in the Rhodesian government of Ian Smith, and in 1965 was a signatory to Rhodesia's Unilateral Declaration of Independence. Gerald Bryan Clarke, GCLM, CMG, 1964, ISO, 1954 was born as Gerald Bryan Sheil O'Cleary Clarke in Gwelo on 1 November 1909, as the son of Irish-Rhodesian parents, Francis Joseph Sheil O'Cleary Clarke and Margaret Shiel. His father arrived in Rhodesia in 1896 following a part played in the Jameson Raid, and became a Justice of the Peace in a long career of public service in Rhodesia that stretched for 38 years. Heidi Holland, also known as Heidi Hull, was a South African journalist and author who had been involved in the journalism industry for over 30 years. She edited Illustrated Life Rhodesia, worked as a freelance writer on publications such as The Sunday Times, The Telegraph, International Herald Tribune, The New York Times and The Guardian, and had also worked on research projects for British television documentaries. She was the author of various books, such as Dinner with Mugabe, an account of her meetings with Robert Mugabe, president of Zimbabwe. Previously she released The Colour of Murder, a critical analysis of the 2002 van Schoor murder trials in South Africa. She also released a book based on the history of South Africa's ruling party, The Struggle: A History of the African National Congress. She was found dead of an apparent suicide in her home near Johannesburg. The Graham Publishing Company operated in Salisbury, Rhodesia, during, at least, the 1960s, 1970s and early 1980s. Lancelot Bales Smith GLM ID, better known as Lance Smith or L. B. Smith, was an English-born Rhodesian farmer and politician. Elected to Parliament in the 1950s, he was a founding member of Rhodesian Front in 1962. He was Minister without portfolio in the cabinet of Prime Minister Ian Smith at the time of Rhodesia's Unilateral Declaration of Independence in 1965. In 1968, after serving as Deputy Minister of Agriculture, he was appointed Minister of Internal Affairs, a position he held until 1974, when he exited politics. 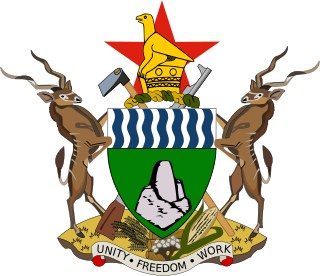 The Centre Party (CP) was a centre-left political party in Rhodesia. Founded in 1968, it was a multiracial party opposed to the discriminatory policies of the country's Rhodesian Front-dominated white minority government. It dissolved in 1977.